Many of Africa's most notorious diseases are transmitted by mosquitoes - including malaria, yellow fever and West Nile virus. However, mosquitoes aren't the only potentially deadly insect on the African continent. Tsetse flies transmit African trypanosomiasis (commonly known as sleeping sickness) to animals and humans in 36 sub-Saharan countries. Infection is usually confined to rural areas and is therefore most likely to affect those planning on visiting farms or game reserves. The word "tsetse" means "fly" in Tswana, and refers to all 23 species of the fly genus Glossina. 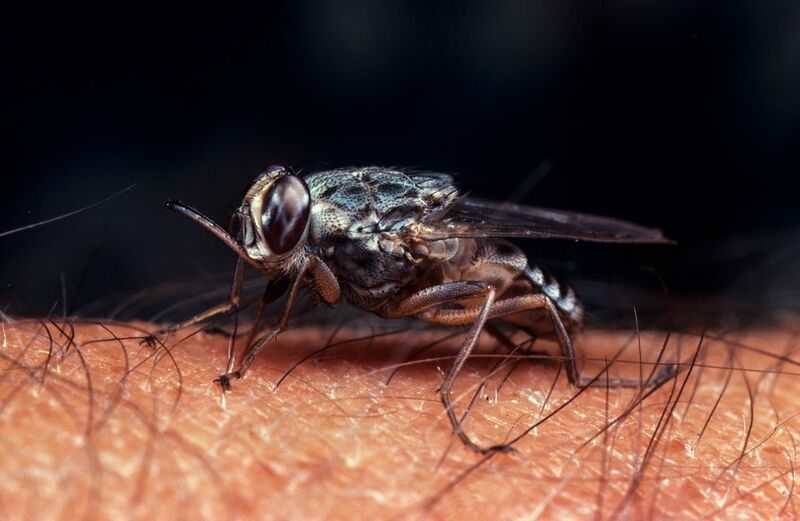 Tsetse flies feed on the blood of vertebrate animals (including humans) and in doing so, transmit the sleeping sickness parasite from infected animals to uninfected ones. The flies resemble normal house flies, but can be identified by two distinguishing characteristics. All tsetse fly species have a long probe, or proboscis, extending horizontally from the base of their head. When resting, their wings fold over the abdomen, one exactly on top of the other. Of the 23 tsetse fly species, only six transmit sleeping sickness to people. There are two strains of human African trypanosomiasis: Trypanosoma brucei gambiense and Trypanosoma brucei rhodesiense. The former is by far the most prevalent, accounting for 97% of reported cases. It is confined to Central and West Africa and can go undetected for months before serious symptoms emerge. The latter strain is less common, faster to develop and confined to Southern and East Africa. Uganda is the only country with both T.b. gambiense and T.b. rhodesiense. Symptoms of sleeping sickness include fatigue, headaches, muscle aches and a high fever. In time, the disease affects the central nervous system, resulting in sleep disorders, psychiatric disorders, seizures, coma and eventually, death. Fortunately, sleeping sickness in humans is on the decline. According to the World Health Organization, the number of reported cases dropped below 10,000 for the first time in 50 years in 2009. In 2015, only 2,804 new cases were reported. The decline is attributed to better control of tsetse fly populations, as well as improved diagnosis and treatment. There are no vaccines or prophylactics for human sleeping sickness. The only way to avoid infection is to avoid getting bitten - however, if you are bitten, the chances of infection are still small (less than 0.1%). If you plan on traveling to a tsetse-infected area, make sure to pack long-sleeved shirts and long pants. Medium-weight fabric is best because the flies can bite through thin material. Neutral tones are essential as the flies are attracted to bright, dark and metallic colors (and especially blue - there's a reason that safari guides always wear khaki). Tsetse flies are also attracted to moving vehicles, so make sure to check your car or truck before starting a game drive. They shelter in dense bush during the hottest hours of the day, so schedule walking safaris for the early mornings and late afternoons. Insect repellent is only marginally effective in warding the flies off. However, it's worth investing in permethrin-treated clothing and repellent with active ingredients including DEET, Picaridin or OLE. Make sure that your lodge or hotel has a mosquito net or pack a portable one in your bag. Keep an eye out for the symptoms listed above, even if they occur several months after you return from a tsetse-infected area. If you suspect that you may have been infected seek medical attention immediately, making sure to tell your doctor that you have recently spent time in a tsetse country. The drugs that you will be given depend on the strain of tsetse you have, but in either case, it is likely that you will need to be screened for up to two years to ensure that the treatment has been successful. Despite the severity of the disease, you shouldn't let the fear of contracting sleeping sickness stop you from coming to Africa. The reality is that tourists are unlikely to get infected as those most at risk are rural farmers, hunters and fishermen with long-term exposure to tsetse areas. If you're worried, avoid traveling to the Democratic Republic of the Congo (DRC). 70% of cases originate from here and it is the only country with more than 1,000 new cases annually. Popular tourist destinations like Malawi, Uganda, Tanzania and Zimbabwe all report fewer than 100 new cases each year. Botswana, Kenya, Mozambique, Namibia and Rwanda haven't reported any new cases in over a decade, while South Africa is considered sleeping sickness-free. In fact, South Africa is a good choice for anyone worried about insect-borne diseases as it has a wide choice of game reserves that are also malaria-free. Animal trypanosomiasis has a devastating effect on livestock, especially cattle. Infected animals become increasingly weak and cannot plough or produce milk. Pregnant females often abort their young and eventually, the victim will die. Prophylactics for cattle are expensive and not always effective. As such, large-scale farming is impossible in tsetse-infected areas. Those that do attempt to keep cattle are plagued by sickness and death, with approximately 3 million cattle dying every year from the disease. Because of this, the tsetse fly is one of the most influential creatures on the African continent. It is present in an area spanning approximately 10 million square kilometers of sub-Saharan Africa - fertile land that cannot be successfully farmed. As such, the tsetse fly is often labeled as one of the major causes of poverty in Africa. Of the 36 countries affected by animal African trypanosomiasis, 30 are ranked as low-income, food-deficit nations. On the other hand, the tsetse fly is also responsible for preserving vast tracts of wild habitat that would otherwise have been converted to farmland. These areas are the last strongholds of Africa's indigenous wildlife. Although safari animals (especially antelope and warthog) are vulnerable to the disease, they are less susceptible than cattle.